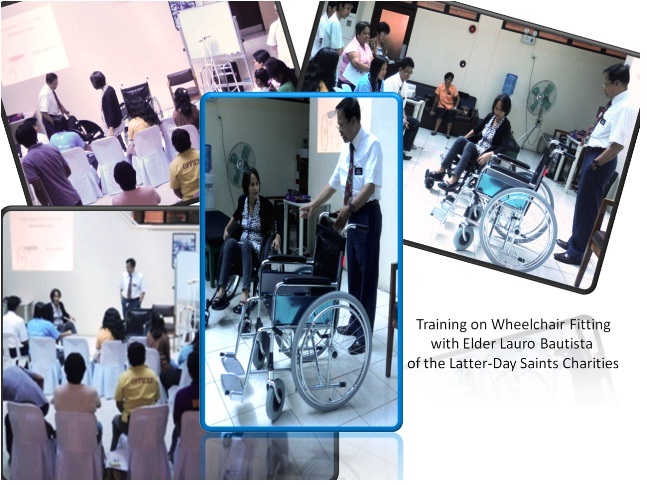 To equip service-providers in effective provision of appropriate wheelchairs to beneficiaries, the Latter-Day Saints Charities (LDSC) held a 2-day workshop for 17 GO/NGO/PO participants from Quezon City , Caloocan City, NCR and San Mateo, Region IV-A last October 24-25, 2011 at the NCDA Atrium. It included demos on wheelchair-fitting, handling and securing, always in consultation with/consideration of the wheelchair-users. I suggest that concern agencies and NGOs who donates wheelchairs will be distributed equally to Congressional Government then to the Provincial Government down to Municipal Government to be fair and no one will say that they are favoring some other places but to hear a good response that has EQUALITIES to all. Idirektang ibigay s mga beneficiaries ng mga wheelchairs by coordination lang ng mga local n ahensiya kc may favoritism din ang mga local n ahensiya lalo n kung ang isang pwds ay hwak niya o lider niya…dpt bgyan ng authority ang mga registered pwds orgs as ngo’s, po’s n meron ang mga pwds s nsabing lugar, cty, municiplities, o bayan upng ang mga lider pwds mismo ang syang nkkaalm qng cnu s knyng mga miyembro ang nid ng mga wheelchairs not the local government, in fairness s galaw ng mga lider pwds n nsa area….